A resident of Gracie Rock pleaded not guilty to eight counts of theft when he was arraigned before Senior Magistrate Sharon Frazer on Thursday. Sherman Hemmans, 27, who is being represented by attorney Anthony Sylvestre, was released on $6,000 bail plus one surety in the same amount after he pleaded not guilty to the charges. His case has been adjourned to June 3. Allegations are that between March 20 and April 1, 2014, he purchased grocery items totaling over $5,000 in value from Everyday Supermarket, located in Hattieville, using a credit card that is the property of Joseph Fusy. Police investigators later linked the card and the purchases to him. 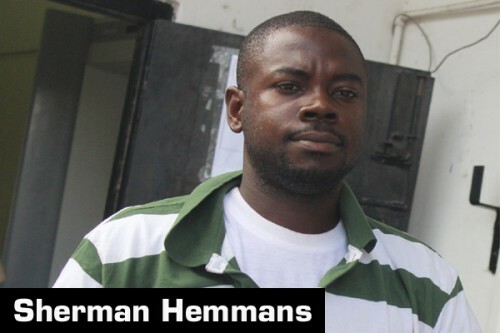 It is being alleged that, for the first count of theft for which Hemmans was charged, he initially made fraudulent purchases – amounting to $1,876.36 – from the grocery store on March 20, 2014. Count 2 is for purchases amounting to $1,035.00 on March 20, 2014. Count 3 is for $735.00 of purchases, made on April 1, 2014. Count 4 is for $450 of purchases on March 25, 2014. Count 5 is for $315.00 of purchases on March 25, 2014. Count 6 is for $300 of purchases on April 1, 2014, Count 7 is for $259.95 of purchases on April 1, 2014, and count 8 is for purchases amounting to $95.00 on April 1, 2014.